Here is our feature sauce from of Lobo, a company that offers great products which are commonly found in supermarkets throughout Thailand. The seafood chile sauce mix is mild, it does not have a high chile heat. The sauce is more to the sweet side, and it can be served with any kind of fish. It's easy to prepare. Combine the contents of this packet with 1 cup water, bring to a boil and cook until thickened, stirring constantly. Serve over any seafood. See pictures below. 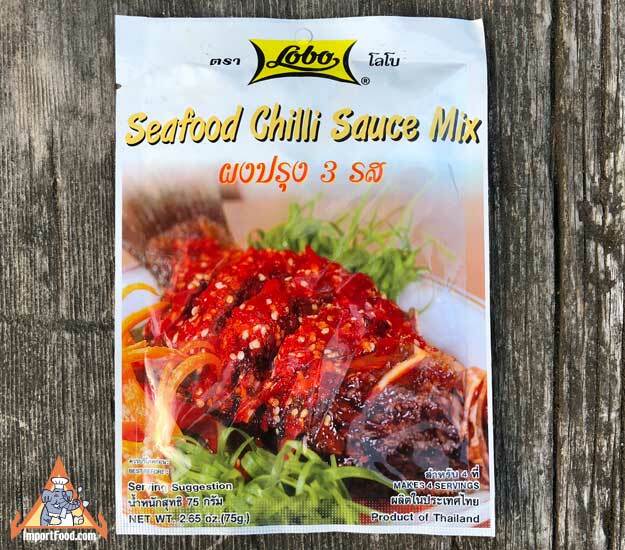 We barbecued cod and prawns then poured Lobo seafood chilli sauce over the top for a very nice meal. Ingredients: sugar, wheat flour, spices, salt, bell pepper, msg, tomato powder, malic acid. No artificial color or preservatives. 2.6 oz envelope. Product of Thailand.